XE pastel pink is 100% waterproof, greaseproof, tearproof, wipeable, punchable and UV resistant. A superior, cost effective alternative to lamination - XE is a polyester based laser film which is tough enough to withstand rigorous daily handling and cleaning. Ready to use straight from the printer, more durable and greener than laminated paper (XE is recyclable, laminated paper goes to landfill), XE saves time and cost when printing on demand. XE pastel shades add colour to any application. Durable yet light weight, it can be folded and punched as required. Ideal for bar and restaurant menus, price lists, public planning notices, maps, reports, presentations, handouts and technical specification sheets. XE is also suitable for signage, separators, point-of-sale applications and any other documents requiring frequent handling, or exposure to other harsh environments. 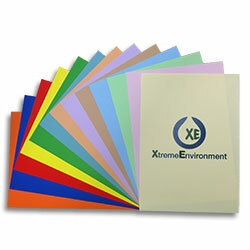 XE pastel shades produce quality print results on mono and colour copiers and laser printers. Suitable for full colour printing on either side, however duplex printing is not recommended on XE pastel shades due to possibility of show through. We recommend use of our sampling service in order to test individual colours for application suitability.